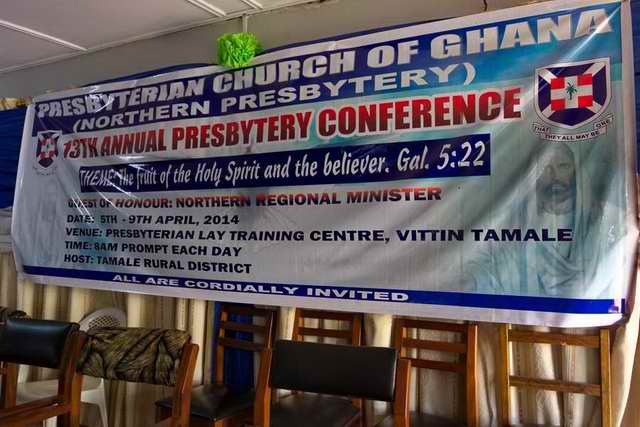 The 13th Annual Conference of the Northern Presbytery of the Presbyterian Church of Ghana was held just south of the city of Tamale at a Presbyterian Lay Training Centre. I attended one of the 5 days. Here are my random observations of that day. They have little to do with the content and more with the “color”. All of the Presbyterian ministers wore clerical collars. Quite a few wore them under the traditional northern garment called a smock – a wonderful combination of traditional and Western dress. The prayer time, lead by a Presbyterian minister, had distinct Pentecostal overtones – all praying at once, prayers against spiritual forces that might come against the conference. Mention was made several times of living peacefully with Muslims who are the majority in the Northern Region. This is important, because there have been sporadic religious clashes. I was reminded that in North America we have never had to live out our faith in a place where most people follow a different world religion. The Association of Christian Chiefs sent a delegation to the conference. Their leader was installed as the chairman of the meetings, even though he spoke in English only through an interpreter. In the past, chiefs were the guardians of traditional belief and practice. It is not a small thing for a chief to break away from that, so much so, that I have heard some Ghanaian Christians say that a chief cannot be a Christian, just like I have heard Americans say that a politician can’t be a Christian. They came in traditional garb. I especially liked their hats! The leader of the delegation from the Association of Christian Chiefs opened the meeting. He said that he is so full of joy that he could only offer a prayer of thanks to God for all the good work the church is doing. He prayed right then, including asking that God would get glory for it all. The meeting was conducted in English. After each person spoke, however, there was a summary translation into Dagbani. 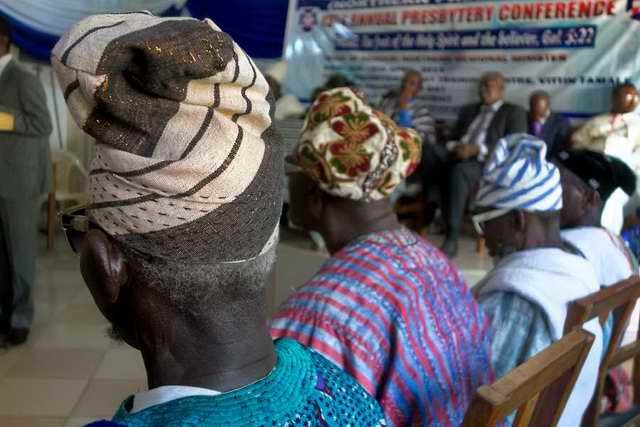 A few, such as the leader of the Association of Christian Chiefs, spoke in Dagbani (the most important local language) and were translated into English. However, none of the prayers, songs done by choirs, or congregational singing, was in English. They were mostly in Twi and Ga (languages of southern Ghana and the languages of Presbyterians from southern Ghana now living in the north), with some Dagbani. African languages are still alive even in high-level meetings. One of the invited guests was a Gynecologist. He said that the most vulnerable people at the hospital were pregnant women and unborn children. In the pas,t mortality in pregnancy and childbirth was very high, being almost a daily occurrence at the hospital. He had instituted changes that brought that down 300%. 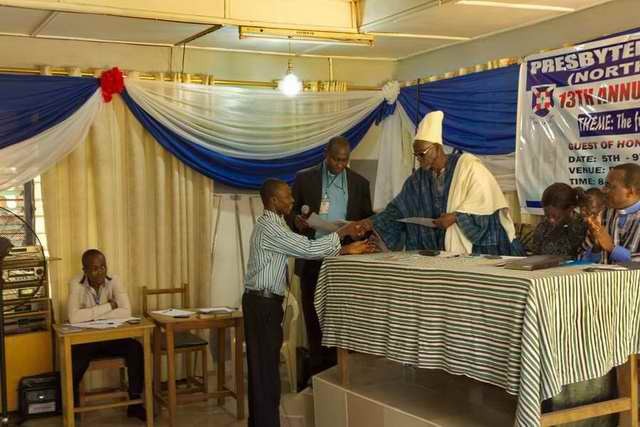 A teacher at a Presbyterian secondary school in the area had been named the second best teacher in Ghana. The Presbyterian Church here is known for quality education. The teacher thanked God for the fact that he serves in a a well-organized school, which allowed him to succeed, and the conference acknowledged him with an award. Invited guests brought greetings from the church or organization they represent. Most bring an envelope, literally, with money to help with conference expenses, which they all call a “token”. A Presbyterian choir in robes sang in Ghanaian languages (from the south of Ghana, not from this area), but in a European style, which they master. It is beautiful. Then a youth choir sang in Dagbani, but in a very traditional style, marked by accompaniment only with a drum, unison (no harmony), complex rhythms, a lead singer singing in solo, with the others coming in on the chorus. This shows that the traditional music forms are still in vibrant use among the youth. There were several mentions of problems with the financial viability of the Presbytery. It appears that many see the solution to the problem coming through church businesses, as much as through the giving of church members. We were there to present a literacy proposal. The vote to adopt it passed unanimously, with much waving of hands and fanfare. 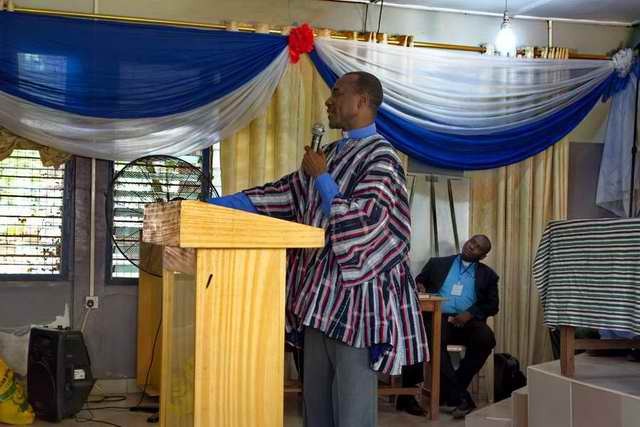 A representative of the national office said that he hoped that the ladies choir (which sang beautifully in the Twi and Ga languages of southern Ghana) would be compelled to sing in local languages in the future because of the number of local women joining the church. He called this a vision for the coming years. He said that faith is not in any one language, but that true faith reaches out and brings in others. The speech from the local political envoy was based on fruits of the Spirit and the fact that society needs them, because otherwise selfishness, crime, conflict, etc. abound. The conference theme was “The Fruit of the Spirit and the believer” Gal 5:22. When asked to speak, one lady quoted a proverb, “When the elder takes his bath, then the water is finished”. I had no idea what it meant or how it applied to the context. I think that she was saying that she was being asked to speak out of turn. In addition to the chiefs in their wonderful hats, and the ministers in clerical collars and smocks, some ladies were in traditional Africa dress, but others in smart, Western business attire. Some men were in suits with ties, and others in traditional wear, including a local member of parliament. So, a person wanting to dress in style has lots of options. Click on any image to enlarge it and start a slide show. 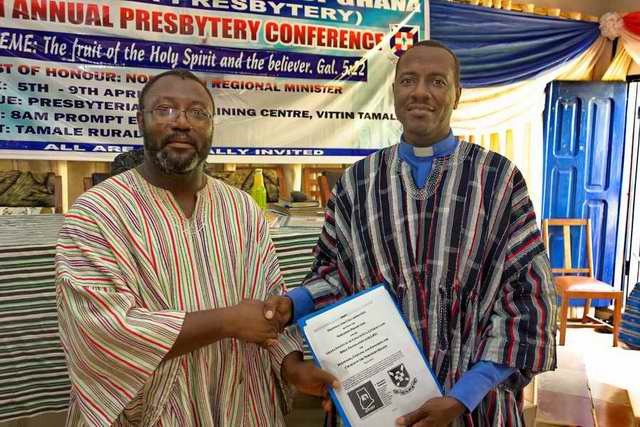 This entry was posted in Christianity, Faith now, Ghana, Language, Literacy, Personal experience, Religion and tagged Northern Presbytery, Presbyterian Church of Ghana. Bookmark the permalink. ← When does it start?